. . .with foot clutch. (All my other bikes had hand-operated clutches). For a few days I even equipped this with a sidecar, in which Appy rode with Anne. But I don't like sidecars; I once went through a hedge with a borrowed one in England, damaging hand and knee; so we turned the sidecar back. That summer I was to be the assistant head of the Putney School Summer Work Camp, so I rode the Indian up to Vermont to make the necessary preparations, left it there to return to Haverford by train, and then drove Anne and Appy up to Putney in the Ford. (The Indian, by the way, had been purchased also from a Haverford student. He was accustomed to use it to make hasty weekend trips to his girlfriend in Savannah, but, deciding to buy an engagement ring, had to sell the Indian to do so. Maybe the ring cemented relations sufficiently to make the frequent visits less necessary). 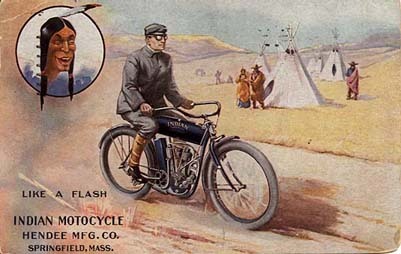 The Indian was equipped with a "buddy seat," an extra long leather saddle, big enough for two people. Annie and I used to ride around on this all over the place until, while in Vermont that summer, it was discovered that she was pregnant and the school nurse forbade her to indulge in these dangerous pursuits.